Looking for easy, party-ready makeup ideas? Here's a look you'll love! 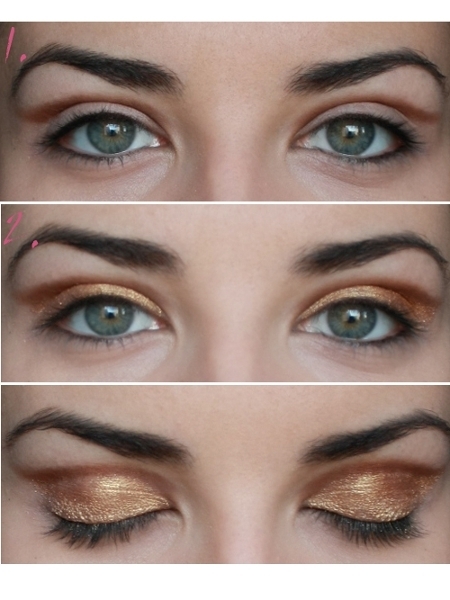 This gold and copper eye makeup look will beautifully emphasize all eye colors and complement all skin tones. Follow this step-by-step tutorial and get your pretty on! 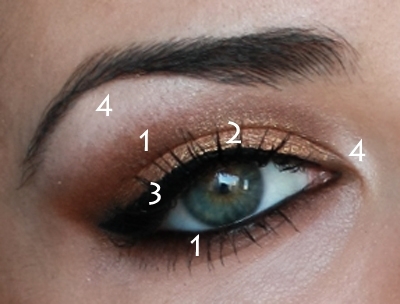 The honeys that are in need of ideas to refresh their style for the party season will have a blast revamping their look with this gold and copper eye makeup tutorial. Shimmery golden tones are beautiful options for the festive season, plus they compliment all eye and skin tones, so if you're stuck on ideas and want to give yourself a glamorous party makeup look, just follow these easy steps. You will need: copper or warm brown eyeshadow, shimmery gold eyeshadow, sheer pearlescent white eyeshadow, black eyeliner, primer & foundation, blush, mascara, makeup brushes. The perfect party makeup starts with a flawless base. Use a mattifying primer on your T-zone if your skin tends to get oily and apply a medium to full coverage foundation for a long-lasting, flawless finish. Step 1. Start by adding depth to the eyes with the copper eyeshadow and work it into the crease using a precision brush with short, firm bristles. Step 2. Then switch to a larger eye brush and apply the gold eyeshadow all over the mobile lid - make sure to use a highly pigmented formula to really make those eyes sparkle! Step 3. Switch back to the copper/brown eyeshadow and connect the crease color to the outer corner of the eyes, creating the sultry cat-eye shape. Step 4. Using a clean soft brush, take your time to blend the edges well. Step 5. 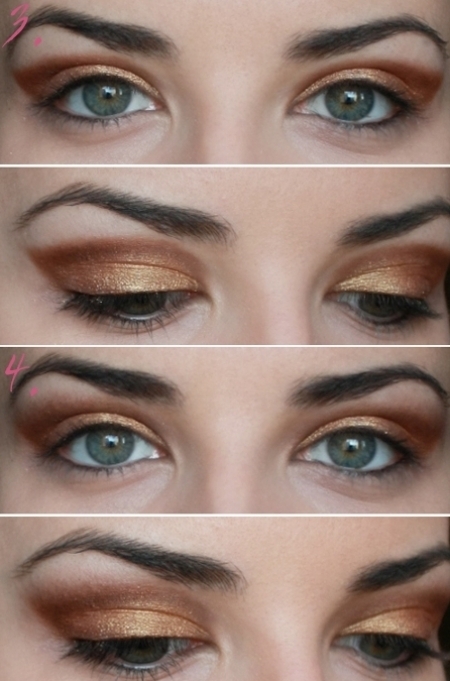 Dip a small angled brush into the copper/brown eyeshadow and work it into the lower lash line. Trace the upper lash line with back liquid/gel eyeliner, then the waterline with a soft kohl pencil. Highlight the inner corner of the eyes and brown bone with pearlescent white eyeshadow which will open up the eyes, then finish off the eye makeup with lashings of mascara. Once your eye makeup is done, use a bronzer/contour blush to sculpt your features and apply a peachy pink blush to the apples of the cheeks. Add a touch of shimmery gold blush to the highest points of your cheekbones to further illuminate the face and finish off the look with your favorite sheer lip gloss!